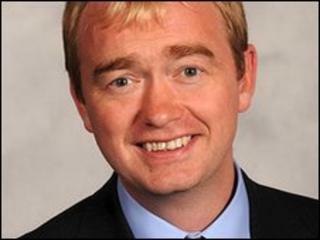 Tim Farron has become the first Lib Dem MP to formally enter the race to succeed Vince Cable as deputy leader. Mr Farron, MP for Westmorland and Lonsdale, has to get the backing of five of the party's 57 MPs by 2 June to go through to the ballot a week later. Mr Cable says he is stepping down to concentrate on his coalition government job as business secretary. Mr Farron said he wanted to maintain the "independence" of the party while in coalition with the Tories. It is also vital that the independence, radicalism and distinctiveness of the Liberal Democrats are maintained. Former leader Sir Menzies Campbell has given his backing to Mr Farron, whose announcement came on his 40th birthday. Sir Menzies said: "We need someone with substance in the role and someone who is both loyal and independent minded. "Tim is one of the best communicators the party has, and represents a bright and confident future for the Liberal Democrats." Mr Farron, who was an aide to Sir Menzies during his time as Lib Dem leader, said: "We were right to enter this coalition because it was in the national interest to do so and because at long last it has given us the chance to create a fair, free and green country. "But it is also vital that the independence, radicalism and distinctiveness of the Liberal Democrats are maintained. "I want to work alongside Nick Clegg to ensure that not only does the country benefit from this coalition, but that the Liberal Democrats' electoral prospects benefit too. "We have Scottish Parliament, Welsh Assembly, local elections and a possible fair votes referendum all within the next year."